Item Nr: KM 12619 Title: Sharing Information About Your Child with Autism Spectrum Disorders: What Do Respite or Alternative Caregivers Need to Know? This resource, written by an expert with decades of experience working with families, eases some of the apprehensions associated with leaving a child with a caretaker, through checklists, forms and other tools designed to effectively communicate about such areas as a child's behavior, daily living patterns and food rituals. 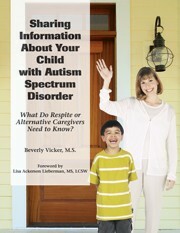 The CD that accompanies the book allows families to quickly adapt a given form to suit their child's needs.